This set contains a large variety of station platforms and station buildings based on stations from the DPRK. Fixed: Buffer stops having the wrong layout. Fixed: Buffer stop platform missing. Changed: Roof of the Kwangok building is now somewhat darker. To make stations you can choose to code them in NFO and M4NFO. NFO is very hard though, so you might consider M4NFO. where `YOURNEWGRF` is the filename of your NewGRF and `src` the folder in which your m4 source code, `YOURNEWGRF.nfx` is. If you run this `.bat` file, it should produce the `.grf` file. If your run it in the command prompt, you'll see the log, should you want to, this way you can see if there are any errors. ```setfeature(_STATION)``` or whatever feature you want to use. Please do not comment with questions about m4nfo installation. If you've installed M4NFO, please take a look at the official tutorials first. If you want to see an example of m4nfo, this project, unlike other m4nfo projects, is completely open-source, so feel free to look into the code of this project. The North Korean Sets - These sets add a large variety of vehicles used in the DPRK - North Korea. This is also the development thread. Last edited by Erato on Fri Dec 21, 2018 5:18 pm, edited 11 times in total. Wow! Always nice to see a new station set, interesting it's in a different language. Great to see some accessible source code for it too! Small update! We now have underpasses. I am also very pleased to see the new set of railway stations. Excellent work . 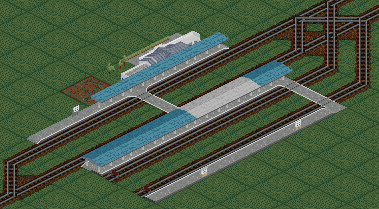 After encountering the same bug Gwyd has, and creating a bodge to get it to work, I managed to finish up the set with all new platforms and station buildings. Of course. There's a bug. Now that's a cool project, are there more East/Socialist bloc themed mods for the game? I'd have some fun doing an East German or Yugoslav city. There are sets placed in Czechoslovakia, which was part of Eastern bloc - I'm/was using CSDSet and Czech Railway Set includes trains, CS Stations set includes train stations , is CS bus set/Long vehicles are some socialist buses and truck (Karosa etc. ), Ikarus set for Ikarus buses, CS Salina set for Czechoslovakian Tatra a Škoda trams and Polish building set has very nice panel buildings. This is really nice set, great job Erato! Nothing new, but I fixed a rather major glitch. Some more bug fixes and also DPRK Stations Addon 0.1! - Pedestrian crossing at the end of platforms. 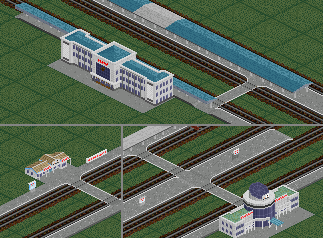 - Roofs with pedestrian crossings and buffer tiles. I was in a buildingy mood after the screenshot competition, so I made some. I hope you like them.